We have received a multitude of accessions in the past week, including one that has travelled all the way from Canada! These items, and the individual story that accompanies each one, tell us of the experiences of those who originally used them. There is often an interesting tale about their return ‘home’ to Edinburgh too. A pile of accession packages builds up! 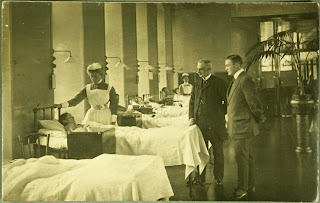 A lady in England has sent two postcards showing wards at the Royal Infirmary of Edinburgh. They were originally sent in 1912 by the depositor’s grandmother, a patient at the Hospital, to her daughter, then a seven year old child. She writes: “Dear, this is a photo of the ward that I am in. That is the door at the bottom, that is the House Dr…your little brother is 7 months old today…I am yearning to be better to get the wee pet back”. The depositor had seen one of our postcards advertising the Royal Edinburgh Hospital bicentenary archive appeal at a family history fair in the Borders, and was reminded of the 100 year old postcards she had at home. Although this deposit relates to a different hospital, we are happy to collect them and add them to our collection. Late last year we were contacted by a former employee of the Museum and Archives of Peterborough Regional Health Centre, Peterborough, Ontario, Canada. This archive had sadly closed and the contents were being dispersed to suitable repositories. We agreed to take a small collection of midwifery training notes from the Simpson Memorial Maternity Pavilion. They were obtained by a former employee of the hospital in Canada, who originally came from Scotland. The collection includes class notes and a case book of deliveries attended by a midwife as part of her training in the 1940s. The misfortune of the Canadian archive has been our gain as another part of Edinburgh nursing history becomes available to researchers here. Earlier this month Stephen attended the Digitisation Doctor seminar, which was held at the National Records of Scotland (NRS) and organised by the Archives and Records Association. This event demonstrated the practices and procedures carried out at the NRS for the large-scale digitisation of their records. These may not be totally relevant for small archives with more limited resources, but many of the individual practices could be imitated. First of all Rob Mildren, Head of Public Services at NRS General Register House gave a brief lecture on the experience of digitisation at the NRS. Initially only a small number of records were digitised there, mainly as part of online exhibitions, however because readers wanted to have whole collections available online, NRS began an extensive digitisation programme from the early 2000s once broadband internet became available to cater for this demand. Digitisation speeds up the retrieval of records and reduces damage to the originals. Ashley Beamer, Web Projects Manager at the Royal Commission on the Ancient and Historical Monuments of Scotland, showed us examples from Britain from Above and Scotland’s Places; impressive image websites which she has been involved in. Robin Urquhart, Online Resources Archivist, highlighted differences between digital and original documents by showing us physical 18th Century tax rolls volumes to compare with the online versions. 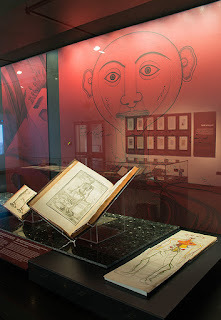 For example, where text is close to the binding, the digital version may become illegible, and some consecutive pages contain spreads of information which must be read together. He also pointed out that accessibility of the online digital images must be considered with regards to meeting disability legislation requirements, so the images should be navigable using a keyboard as well as a scrolling mouse. Paul Riley, Digital Imaging Unit Manager then led a tour of the image processing and digital imaging rooms, which buzzed with activity. A feature of the digital scanners was that the glass lids were lifted using compressed air to prevent injuries and keep the hands of the operator free as they adjusted the records between scans. 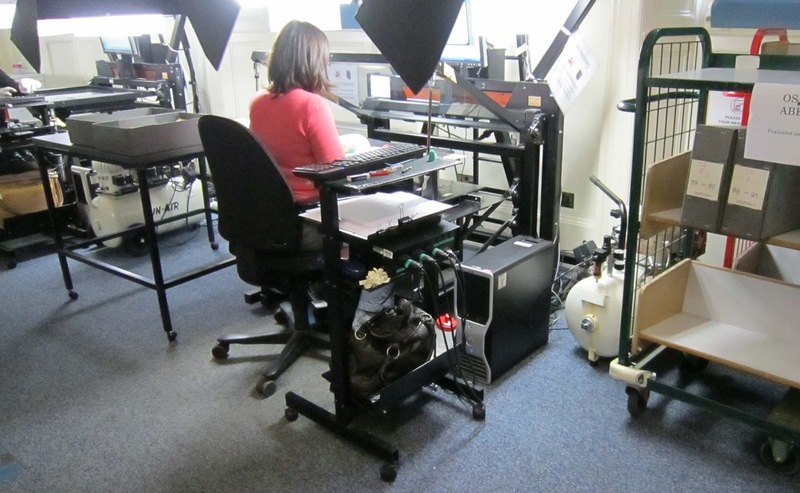 Most of the digitisation now done at NRS is related to project work, since the most popular documents requested by readers have already been digitised. This event was extremely useful, because although LHSA has already made small sets of photos available online on Flickr and as page turners via our website, more substantial amounts of digitisation are likely to be done in the future. It was therefore good to learn what some of the technical requirements and resource implications are likely to be when this is attempted. This is the question that the current exhibition in the Edinburgh University Main Library Exhibition Gallery, ‘Masterpieces III’, hopes to answer! 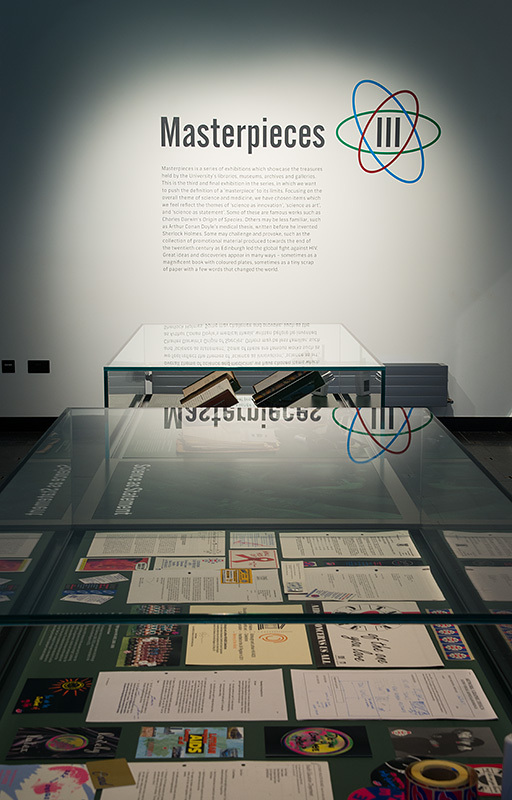 ‘Masterpieces III’ is the final instalment of an exhibition programme that started in 2009, in the then brand new facilities in the Library. From what was a straight forward exhibition of beautiful objects in the first ‘Masterpieces’, we have moved to a much more thought-provoking series of items that might not have been traditionally thought of as treasures. A variety of material from across University Collections is on display and, as this exhibition is themed around science and medicine, LHSA items feature prominently. 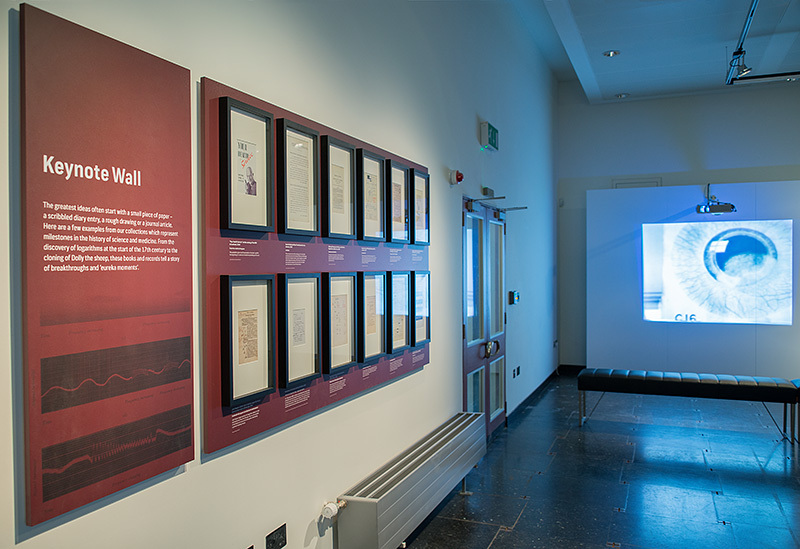 This is a great opportunity to see some of our collection including a selection from our UNESCO-awarded HIV/AIDS Collections, a notebook that charts the invention of the bionic arm and a silent film about the Royal Infirmary from the 1930s. We hope these pictures tempt you into coming to have a look yourself. The exhibition is free and open to all from Monday to Saturday, 10am to 5pm. ‘Masterpieces III’ will be on display in the Edinburgh University Main Library Exhibition Gallery (30 George Square, Edinburgh, EH8 9LJ) until 6 July. I have been a volunteer on the Norman Dott project since the beginning of March: in this time my knowledge of medical terminology and neurology has vastly increased. It is amazing how over such a short time you can become so familiar with patients symptoms and diagnoses. I have been cataloguing Norman Dott’s case files using Encoded Archival Description (EAD) in an XML editor. At first I thought this looked extremely complicated and intimidating – however, as time has gone on I have become increasingly confident with the catalogue and now feel very much at ease with it. In my first few days at LHSA I was introduced to confidentiality legislation and NHS guidelines relevant to the documentation that I am working with. The legislation and guidelines assign closure periods to records that contain sensitive personal data relating to living and deceased individuals. This was a whole new concept to me as I had never dealt with patient records before in anything I had previously done. As I continue to go through the case notes, the more correspondence and notes I read, the more impressed and captivated I am at the level of familiarity and time that Norman Dott had for his patients. In many of the folders there are letters between himself and his patients, all with a distinct degree of kindness and warmth. He seems to me to have been someone who genuinely cared for his patients and who had a sincere concern for their wellbeing. Some case notes are more detailed and intriguing than others: some patients have very obvious complaints whereas with others there is an element of mystery. Even after all this time I still feel a degree of sadness over a patient if it is noted that they have died. I did not know them or their families yet I always feel upset for those who were lost. Having not come from a particularly medical background I was surprised by the lack of emotion which is shown within the case notes. Although they are obviously clinical being medical files, they can seem detached and void of feeling. The only level of sentiment which is experienced within these files is the correspondence which is sometimes included, which is perhaps why it stands out as more remarkable. One case in particular has captivated me over the last few months, dealing with a young boy who suffered from a brain tumour at a very young age. Dott operated on him, saving his life, after which he grew up and led a full and happy existence. 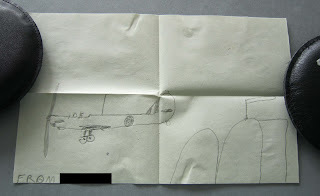 Within this file there was an array of correspondence from his eternally grateful parents, cards and a drawing from the young boy himself. This drawing of an aeroplane (see below) really touched me. I thought this gesture from the boy was just so pure and untainted. The fact that this family remained in touch with Norman Dott for the next twenty years with continual updates on the boy’s life shows, to me, the affect Dott had on people and their lives. These case files can sometimes contain photographs, usually of tumours which have been removed but occasionally of people themselves. 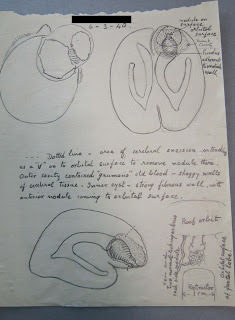 Sometimes they include drawings by Norman Dott, usually illustrating the position of the tumour within the person. 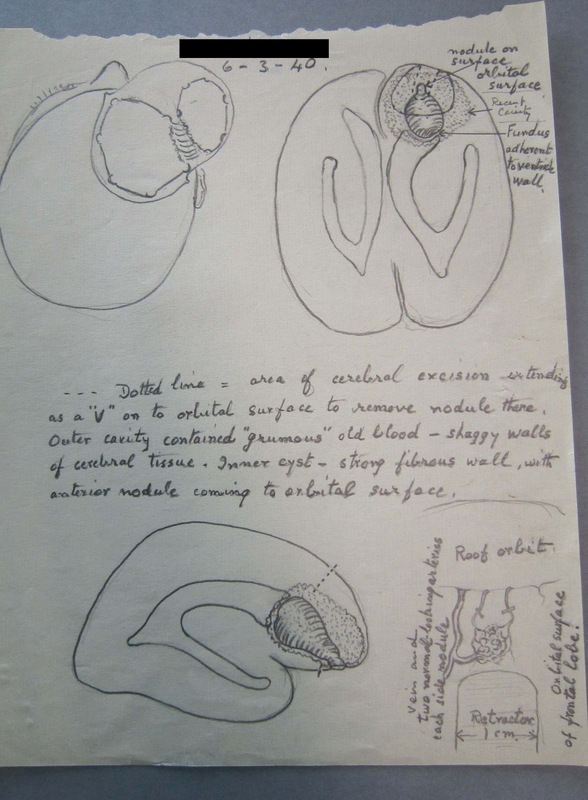 These drawings are fascinating to discover as they give an insight into both Dott himself and how he processed his diagnoses. (See picture below). In one of the case notes I also have found a newspaper article written by a patient of Dott describing his experiences and remarkable recovery. This article was printed nineteen years after Dott had operated and the patient was as fit and healthy as anyone else, remarkable as before Norman Dott operated he was almost entirely paralysed. I am thoroughly enjoying working on this project. Each day you discover something different or learn something new. There is such a degree of anticipation with the opening of each new case note as to what will be discovered and revealed from within it. I was the archives intern, but the LHSA have invited me to stay on as a volunteer to finish off this project, which I am determined to do! I am currently well over half way through my cataloguing and rehousing of part of the LHSA photograph collection. The Dental Hospital, the Royal Edinburgh Hospital and the Bangour photographs are now completely re-housed and catalogued and ready to be viewed by the public. I am now working on the megalithic collection that is the Royal Infirmary of Edinburgh photographs. I’m not even half way through these photographs, but the number of those catalogued is now 1309! Once these are done, there is sure to be a small celebration in the CRC office. In the next couple of weeks, some photographs of my, and the conservation intern, Charlotte’s, projects here at the LHSA will be put up on the LHSA Flikr page. They will illustrate what our tasks were for the 10 weeks we were here and the achievements we made.